The Krebs Cycle, also known as the citric acid cycle, is the second major step in the aerobic oxidation of glucose within living organisms. Most organisms use glucose as a major fuel source, but must break down this glucose and store the energy in ATP and other molecules. Then, the cell uses this energy to power various cellular reactions, such as the activation of enzymes or transport proteins. The Krebs cycle is the second of 4 different processes which much happen to extract the energy from glucose. Altogether, the Krebs cycle consists of 9 sequential reactions. The first step of utilizing glucose, glycolysis, produces a few ATP as well as the molecules which will be processed with the Krebs cycle. During glycolysis, a single glucose molecule is split into two smaller, three-carbon molecules called pyruvate. Pyruvate is then converted to acetyl CoA. Acetyl CoA is then utilized within the Krebs cycle to produce several major products. In turn, these products then drive the formation of ATP, the cell’s main energy source. Before the first stages of the Krebs cycle, pyruvate is converted into acetyl CoA. During this process, one molecule of CO2 and one molecule of the electron carrier NADH are produced. The Krebs cycle involves converting this acetyl CoA into carbon dioxide. During the steps of the cycle, two molecules of CO2 are released, in addition to 3 more molecules of NADH, one of FADH2, and one of GTP. A molecule of glucose contains 2 pyruvate molecules, so 1 glucose molecule will produce double the amount of products listed above as it moves through the Krebs cycle. These products will then be converted to ATP in later stages of aerobic respiration. Carbon dioxide is the only “waste” product and must be removed from the cell. Large organisms must remove carbon dioxide from all their cells. In these animals, carbon dioxide is typically exchanged in the gills or lungs for oxygen, which helps drive the final stages of aerobic respiration. The Krebs cycle happens only within the mitochondrial matrix. Pyruvate is formed in the cytosol of the cell, then imported into the mitochondria. Here, it is converted to acetyl CoA and imported into the mitochondrial matrix. The mitochondrial matrix is the innermost part of the mitochondria. The graphic below shows the different parts of mitochondria. The mitochondrial matrix has the required enzymes and environment for the complex reactions of the Krebs cycle to take place. Further, the products of the Krebs cycle drive the electron transport chain and oxidative phosphorylation, both of which occur in the inner mitochondrial membrane. The electron carriers will dump their electrons and protons into the chain, which ultimately drives the production of ATP. This molecule is then exported from the mitochondria as the main energy source for the cell. 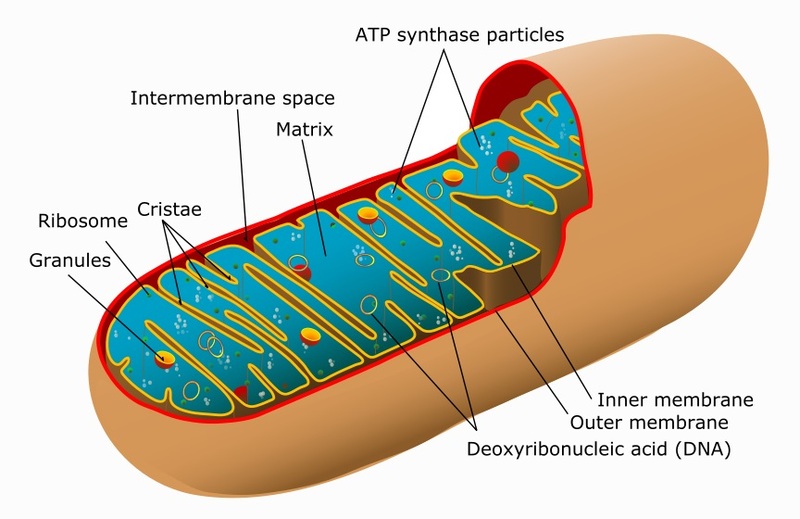 Mitochondria are found in almost all organisms, especially multicellular organisms. Plants, animals, and fungi all use the Krebs cycle as an indispensable part of aerobic respiration. The Krebs cycle has 9 main reactions, which happen quickly in succession. The image below shows these reactions. Note that citrate is the first molecule created after acetyl CoA is added. This is why the Krebs cycle is also known as the citric acid cycle. The products of the cycle are in the image above. This process is known as a “cycle” because it always ends on oxaloacetate which can be combined with a new acetyl CoA to produce a new molecule of citrate for each cycle. The Krebs cycle is likely the most important part of the process of aerobic respiration because it drives the formation of electron carriers. These carriers are important. They carry the energy used to create a large number of ATP molecules in the final steps of aerobic respiration. The electron carriers produced (NADH and FADH2) cannot provide energy to cellular process directly. Instead, the processes of the electron transport chain and oxidative phosphorylation will use the energy from these molecules to activate the enzyme complex ATP synthase, which produces ATP. A. Prepare pyruvic acid to undergo the Krebs Cycle by encouraging and supporting it emotionally. B. Split a glucose molecule into two pyruvate molecules. Pyruvate can then be converted to acetyl CoA, which can enter the Krebs cycle. 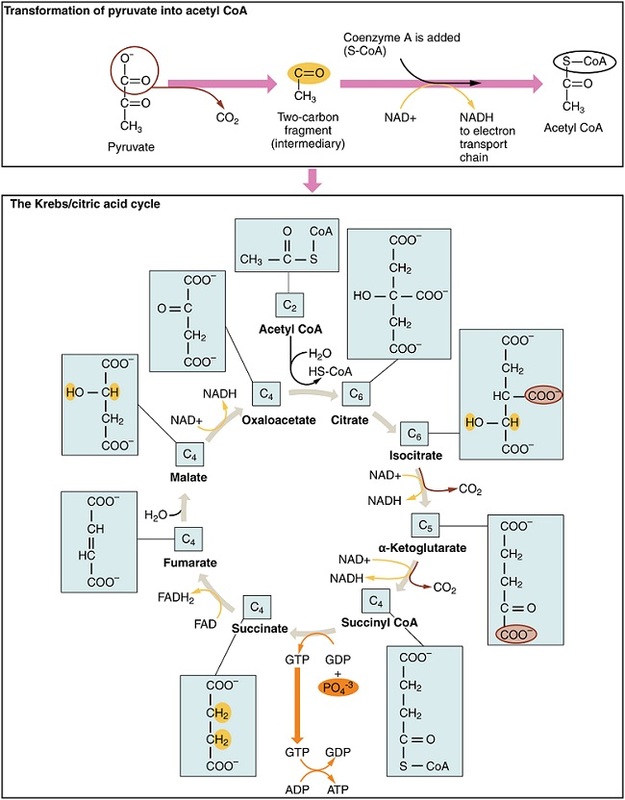 C. Glycolysis is not an important precursor to the citric acid cycle. 2. NADH and carbon dioxide are products of the Krebs Cycle. NADH is _______ and carbon dioxide is _________. 3. Two molecules produced by the Krebs Cycle, NADH and FADH2, form what function in the body? A. These substances carry energy in the form of protons and electrons to the electron transport chain, which drives ATP production. B. These molecules are the main source of energy that cellular reactions use. C. These substances have no function, and are simply byproducts. 4. The Krebs cycle produces no ATP itself. Why is it still important for the production of ATP? A. It is not important. B. It produces many electron carriers, which store the energy that will later be used to create ATP. 5. Which of the following groups use the Krebs cycle?